Only 1set left in stock! Poly and metal table lamp with bronze crackle finish. Features nite light in base. 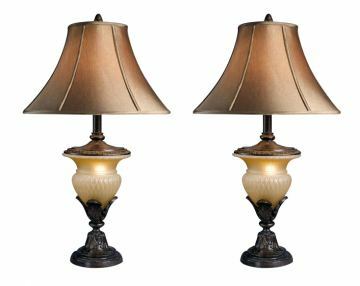 The Danielle Table Lamp is a bronze crackle base with glass body table lamp topped witha beige silky bell shade and features a 4-way switch and a night light in the lamp base. Shade: 8" x 20" x 13.5"